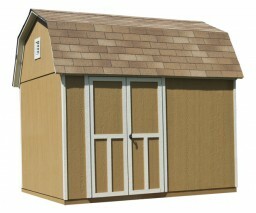 This 8 x 10 shed features a strong and beautiful contemporary design from top to bottom. Endowed with 6” deep roof overhangs and arched gable vents, your outdoor storage solution will be well protected from the elements. The wide 56” double doors provide simple and convenient access to lawn mowers, tractors, wheelbarrows and much more. As you navigate inside, the 6’4” tall sidewalls will make storing long handled tools and equipment easy. All of these premium features are attached to a robust 2x4 wood frame. This shed was designed to change the way you think about outdoor storage. 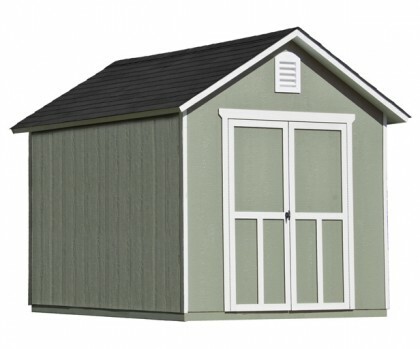 With your choice of five beautiful colors of shingles and a quality selection of functional and decorative accessories, customizing this 8 x 10 shed to match your vision is easy. Add windows to add extra light inside or add a shelf and workbench to aid your daily tasks. Your local building authority may have specific requirements resulting in additional cost. Prices do not include painting, staining, permits, zoning and setback advice and/or compliance, excavation, or leveling beyond 6". All prices and content are subject to change without notice. Promotions are valid with online transactions only and cannot be used in conjunction with promotions at a servicing sales/distribution center or distribution center. Not valid on prior purchases. All stated sizes are nominal dimensions and approximate. Some buildings may be shown with optional items. Additional mileage charges (if applicable) and taxes will be calculated after checkout process is completed. Painted 8 x 10 outdoor storage shed is a representation only, arrives primed for painting in a light beige color. Gable Shed is perfect for my needs. To have this shed built on my property right where I want it and be complete in one day to my order exactly leveled and supported and locked up & the keys in my hand when done, is outstanding. Love it. Great Shed for the money. Needs to be painted and caulked. Getting ready to install shelving. Cut out the middleman with Shed Liquidators. 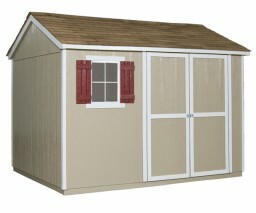 Great service great shed awesome awesome price !!!! We bought this shed for around a $1000.00 last year, this included install, work bench/s, and window. We couldn't not be happier, the gentleman who built the shed did it all by himself in one day. It is a solid building and has plenty of room for all of our yard tools. Crew was fast and professional, the doors have needed to be adjusted a few times but seem ok now. Would have taken me a few weekends to build one myself, they were done in 4 hours. I would have saved a few hundred dollars but spent much more time. The only complaint is that the floor is OSB not plywood. Nothing a thick coat of paint can't solve.